When I started using my NAS as my DIY NVR, it was more of an experiment than anything else. 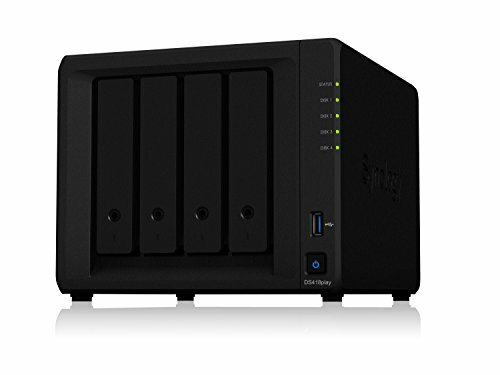 Here I had a NAS that I primarily purchased for backing up all our devices and media serving, but which could also serve as an NVR. So why not try that before buying a dedicated NVR like a Hikvision? But over the last few years, QNAP and Synology NAS devices have matured into a real competitor to a dedicated NVR, and I have documented my DIY NAS NVR setup here. 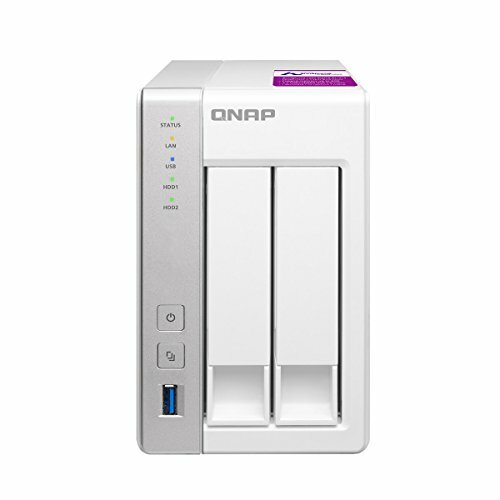 My current NAS, the QNAP TS-253A even has an Intel processor and can run Linux or Windows virtual machines. So its a good time to take a detailed look at the NAS market and see what choices we have for a multi-purpose low-power all-in-one DIY NAS NVR. Which NAS do I use as my NVR? A quick note: This article may contain affiliate links from Amazon and/or other platforms. This is how we pay the bills and ensure an ad-free distraction-free experience for you. If you click on one of these links and then purchase something, we will receive affiliate income for referring you. This goes towards the costs of hosting and running this website and does not cost you anything extra. Thanks for understanding! Also note that Hikvision and Dahua do not consider certain platforms including Amazon as an authorised seller, so we recommend B&H Photo who are authorised resellers of Hikvision and Dahua products. How does a NAS do surveillance? A NAS is basically a computer that runs a custom Linux operating system created by the manufacturer (Synology, QNAP, Asus etc.). Most manufacturers offer various apps that can be installed on their devices to add or extend its abilities. These apps are usually called ‘stations’. Examples of stations include Photo stations, Video stations, Backup stations and Surveillance Stations. In my opinion, the best surveillance station apps are the ones from QNAP and Synology. The modern household is a tech-heavy environment. Every family member probably has at least a smartphone, and probably a laptop. Sharing media and documents across the home is a challenge without a central media server. This is where a NAS typically comes into the picture. Providing redundant RAID storage, a NAS can serve up documents, stream music and movies to any device through the DLNA standard. But the NAS can do so much more. I use mine as a VPN server to securely connect from outside the home and access my home automation system, turn on lights, turn up the heating, check out my security cameras and more. Almost every NAS sold today has a surveillance camera feature, but only two companies have the software that can really pull it off – QNAP and Synology. They are broadly comparable and so I consider them to be equally good. The DS 218 family comprises of the DS218j, the DS218, the 218play and the 218+. The ‘se’ model of yesteryear has been discontinued but it was anyway too weak for surveillance purposes. The 218j has a dual core Marvell processor with 512MB RAM. While this may not sound like much memory, bear in mind that these NAS boxes are basically extremely energy efficient Linux PCs. Linux doesn’t need as much RAM as Windows and so 512MB RAM is good enough for recording up to 14 IP cameras at 1080p and 15fps on Surveillance Station. 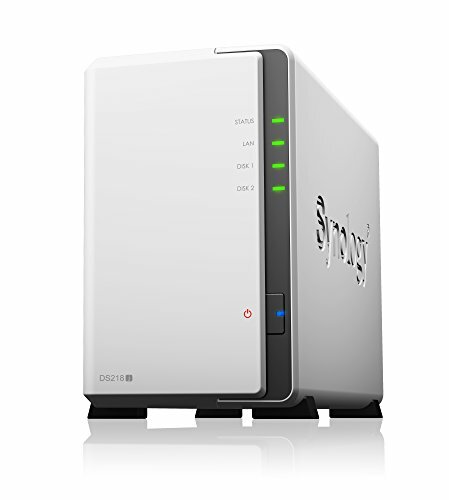 Moving into QNAP’s Home and SOHO product offerings, the TS-251+ improves upon the popular TS-251 model. If you want a powerful Intel chip in your NAS, the x51 series are the go-to QNAP models. On paper, the much older quad-core Celeron J1900 processor of the TS-251+ looks faster than the dual-core Celeron J3355 of its direct competitor, the Synology 418 play. But in reality the newer J3355 is slightly faster overall. Also the J3355 has the Intel Graphics 500 chipset on-board and supports faster DDR-3L memory. Both CPUs support virtualization which means you can run virtual machines which can even access the network ports. This is great for running different operating systems on your NAS, such as testing/development on Android. 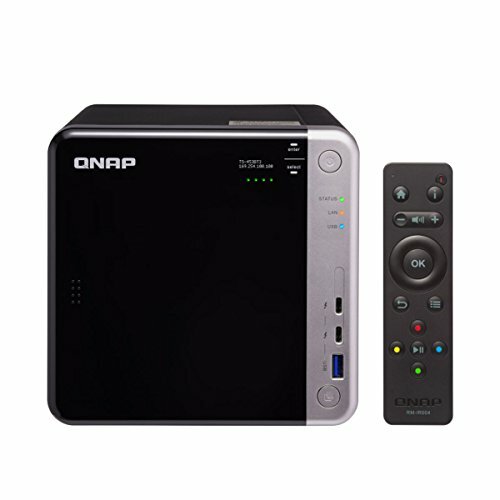 While you can run Plex on this NAS, bear in mind that only the QNAP apps work over the HDMI port. So you can live view your cameras over the HDMI port, which is the feature I am most interested in. Since the NAS has low power consumption, it makes the ideal DIY NAS NVR. 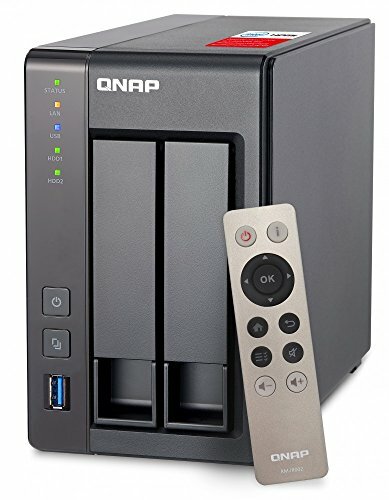 4K is not supported though, so consider the QNAP TS-253Be if you need that feature. This spot on the list used to be occupied by my TS-253A. But QNAP replaced it with the short-lived TS-253B and now the TS-253Be. The e in the model name represents the PCIe 2.0 x2 slot this NAS has. This slot allows you to extend the NAS capabilities by adding SSD caching, 10GbE support or a wireless card. 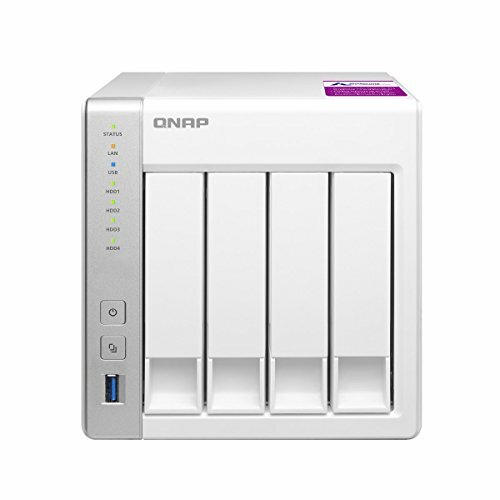 The QNAP x31 series is the starter option in the QNAP NAS family and range from 2 bay model to 8 bay models. The P2 models are roughly on par with the older 231+ model and have a bit more power which is really useful when it comes to running Surveillance Station. The 431P2 has a quad-core Annapurna Labs ARM-based processor with 1GB or 4GB RAM options. The 4GB RAM model is a very capable multi-tasker. My old NAS, the TS-231+ had specs similar to this model and could easily record 4 IP cameras at 1080p resolution at only 10% CPU utilisation. That leaves a lot of headroom for streaming media using Twonky (DLNA). The play variants of Synology’s NAS boxes are aimed at those looking for a rich multimedia and DLNA streaming experience. So it has a beefier Celeron J3355 processor which is also great for running Surveillance Station. The outgoing 416play model had an older Celeron N3060 processor. You can stream music, a single 4K stream or up to 3 simultaneous streams of 1080p video across your network using DLNA. H.264 (AVC), H.265 (HEVC), MPEG-2 and VC-1 video formats can be decoded by the 418play. There is no support for virtualization. There is no HDMI port but if you don’t want one the 418play may be the right choice for you. But there is an interesting option if you want to expand on the surveillance abilities of this Synology Diskstation, you can buy the add-on Visual Station VS360HD device. Synology describes the VS360HD as a “live view and management companion”. It is basically a turnkey NVR which offloads the Surveillance Station functionality from the NAS on to itself. Just like the TS-253A, the TS-453A has been replaced by newer models. But the 453 family is quite large comprising of the TS-453B, the TS-453Be, the TS-453BT3 and the TS-453Bmini. The T3 in the model name represents the 2x Thunderbolt 3 ports on this NAS. Thunderbolt support is a must-have for creative professionals and video editors, so that’s the target audience here. However it is also useful for high speed data transfer which is great for surveillance data access purposes. Synology positions the DS-918+ in its new Plus category (the erstwhile Workgroup and SMB category), but that doesn’t mean its not suitable for home use. If anything it has more than enough power for home surveillance applications. While the outgoing 916+ model had an Intel Pentium 3710 chip, the new 918+ has switched to the Celeron family. The Celeron J3455 chip is still a quad core model which helps it breeze through typical NAS duties. The new chip is much faster and has the newer Intel HD graphics 500 chipset. But it may still struggle when it comes to 4k->1080p transcoding. The 918+ is available only in 4GB guise – but you can upgrade it to a total of 8GB RAM. The extra RAM can be useful if you are running close to the maximum 40 IP cameras. The TVS-863 uses a fast and powerful AMD processor with on-board Radeon graphics. This makes the NAS particularly suited to multimedia and surveillance duties. Even though the NAS is aimed at small businesses, the multimedia features are what makes this NAS box shine. On offer are two HDMI ports capable of 4K output, audio in and audio out which can be very useful for surveillance applications, and powerful hardware to keep everything chugging along nicely. If you want the ultimate backup server, media server, and DIY NAS NVR, don’t look any further. The TVS-882 is at the top end of the market but that’s because you get the latest hardware technology together with enterprise level software features. There are 3 HDMI ports which can each support 4K at 30fps. This means you can have mirrored or extended display configurations to monitor your IP cameras. Speaking of which, this NAS is so powerful that it can record up to 80 separate channels. The precursor of the TS-231P2 was the TS-231+ which was my first NAS. Running on ARM processors, the 231P2 is still plenty powerful enoughfor running a 4-8 camera setup. So there you have it, these are my recommendations to build the best DIY NAS NVR in 2019. Leave your thoughts below! Hey! Thank you very much! You really helped me out. Take care! Question… Any thoughts on WD’s integration with Milestone Arcus? I have used Milestone previously, and like it, but really trying to figure out what I am going to use next (my previous setup was on a Win7 machine which doesn’t hold up with Win patches). Milestone is not the cheapest, but it is pretty decent. 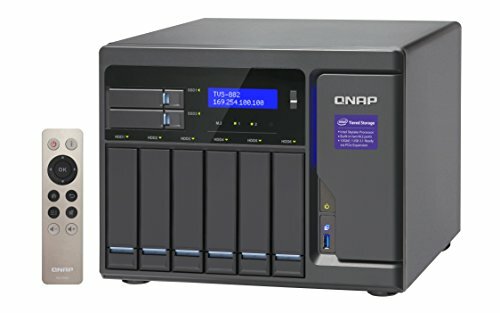 Daniel–do you have any thoughts on the QNAP TS-253A vs the 253B? Several websites are positioning the 253B and the latest version of the 253A. I think the 253B will eventually replace the 253A, although at the moment both are available to purchase. Hardware differences: Apart from the updated processor(J3455 vs. N3160), the 253B also has the newer USB Type-C connector on the front. The 253B has an 8GB RAM variant. There’s an SD card slot and one extra USB 3.0 port on the 253-B. It can also be upgraded to a 10 Gigabit LAN port via a PCIe expansion card, which you cant do on the 253A. The front OLED display now shows you system information and has 2 capacitive touch buttons also. Software-wise, they are the same except for a voice assistant that makes system announcements. Personally I don’t care for USB Type-C or any of the updates the 253B has, so I would have still bought the 253A IF it was cheaper. I think the Synology software is just a bit more polished. I haven’t spent enough time playing with the Synology DSM software to comment on functionality unfortunately. My understanding is that the Synology and QNAP are evenly matched when it comes to Surveillance Station, VPN and just using it as a RAID server. The main difference is cost. 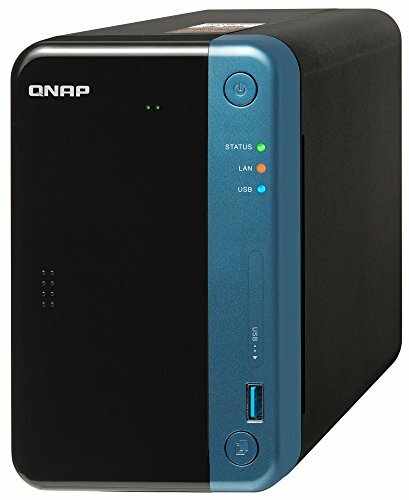 In my experience, QNAP is up to 10-30% cheaper than the comparable Synology model. Plus some QNAPs come with more free IP camera licenses than Synologys. With QNAP you don’t need Blue Iris to connect your cameras to HomeSeer. I have written a tutorial that shows you can connect Surveillance Station directly to HomeSeer. Daniel–One additional question: Do the NAS devices include the applications to run as a surveillance NVR, file server, and VPN? Or do those applications/licenses cost extra? It’s hard to tell from their websites. Yep all of this and more comes pre-loaded on the NAS. They are incredibly cheap for what they can do! Just remember that the number of IP camera licences that come bundled with the NAS depends on the specific model. For example my QNAP TS-253A has a very unusual 4 IP licenses. 2 is more common for 2-bay models. With the 64-bit x86 based QNAP models that have more than 4GB RAM, you can also install the free QVR Pro alternative to Surveillance Station that gives you 8 IP camera licences regardless of how many licences it came with originally. One downside of QVR Pro is that it can only play back the last 14 days of videos. I appreciate the information your have provided, I have found it useful as I am just starting my first security camera system setup. I would like to ask, what are your recommendations for 2018? 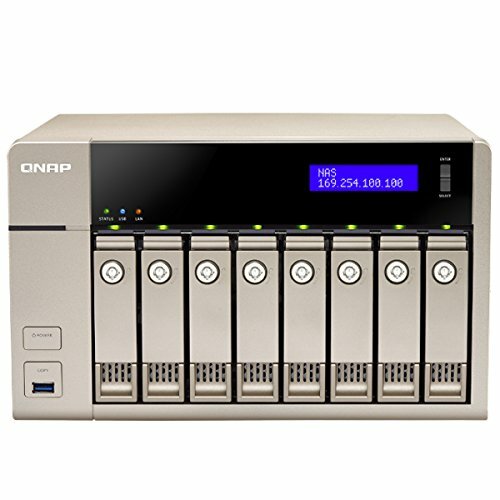 For example, what is your opinion on the new QNAP HS-453DX?